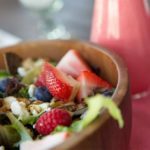 This Very Berry Salad with Honey Sweetened Raspberry Vinaigrette is the perfect way to welcome summer. All of your favorite berries on top of a bed of greens sprinkled with feta cheese and candied almonds. Drizzled with a fantastic vinaigrette. In a large bowl, pile your greens and top with all of your berries and sprinkle with feta. Set aside while you prepare your candied almonds. In a small saucepan add your almonds and sugar and stir constantly heating to medium-high. Sugar will begin to melt after about 5-7 minutes. Do not stop stirring your nuts. Once the sugar begins to melt it will harden quickly. Stir briskly to evenly coat the almonds. When all of the sugar is dissolved, remove from heat. Transfer almonds to a paper towel to cool. Sprinkle cooled almonds over top of salad greens, berries and cheese. Prepare your dressing by adding all ingredients to your blender. Blend on high until a smooth consistency is achieved. Drizzle desired amount of dressing over salad. Enjoy.